Let me preface this review by saying that I have been looking forward to Tom Hooper's screen adaptation of Les Misérables since I first heard it was being made. I'm a big fan of the musical, and absolutely loved the West End Production. If you don't like musicals, are not a fan of large scale costume dramas or Hugh Jackman, you probably won't enjoy the film. I've read some uncomplimentary reviews written by people who seemed to have gone in having decided they weren't going to like the film. However, as someone who has a moderate to excessive appreciation for musicals (yes, I am currently listening obsessively to Mandy Patinkin singing show songs in Oscar and Steve), and this musical in particular, I don't think it went far wrong. From the grand opening scene with Jean Valjean and the other convicts, and their energetic chorus of 'Prologue: Work Song', I knew I was going to enjoy this film. It was immediately obvious that it was going to do precisely what I wanted for it to do, namely add the drama (sweeping shots of scenery, and close-ups of characters) that a stage musical can't achieve. 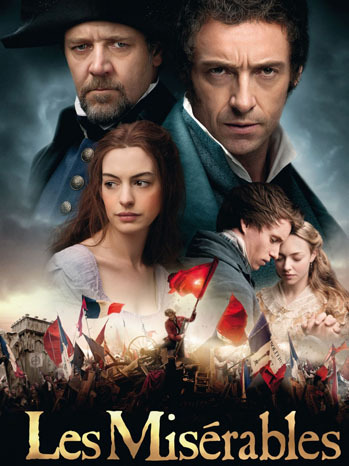 Hugh Jackman is well-cast as Jean Valjean, a man serving a hefty sentence of hard labour for stealing a loaf of bread to feed his starving sister's child. Once his sentence is up, he is branded a criminal by everyone, until he comes across a kindly priest, who offers him the chance of a fresh start. Valjean manages to turn his life around, and when we next encounter him, some eight years later, he is the mayor of a small town, well-groomed and wealthy. Anne Hathaway is mesmerizing as Fantine, a single mother, turned out on the streets when her employer discovers she has a child. Destitute and alone, Fantine turns to a life of prostitution, until she is taken into Valjean's care. He rescues her daughter, Cosette, but is pursued by the ever-present Javert (Russell Crowe), and must go into hiding with the child. Nine years later, as a group of young men prepare for an uprising of the people, Cosette falls in love with Marius, the young revolutionary. When Valjean learns of his ward's feelings for the young man, he is compelled to intervene, and make sure Marius survives the brutal fight that ensues. Hooper's vision of 19th century France is gritty and visceral. Considering the story itself is extraordinarily upsetting, his choice not to romanticize the setting is a brave one. Songs such as Fantine's 'I Dreamed a Dream' were made utterly harrowing by the close up shots of Anne Hathaway's face, tear streaked, dirty, and desolate. Personally, I liked this choice, but I couldn't help feeling that when it came to the comic relief (provided by Eponine's parents played by Sacha Baron Cohen and Helena Bonham Carter), the audience were laughing a little too heartily, as though desperately seeking respite from the more traumatic scenes in the film. Vocally, the cast is generally strong. Hugh Jackman's weakest moment is his rendition of 'Bring Him Home' (he just can't reach the notes), but otherwise I think he makes an excellent Valjean. There has been much criticism leveled at Russel Crowe for his portrayal of Javert, and while he has one of the weaker voices in the cast, his acting sold it for me, and his last scene is extremely powerful. The ever-boyish Eddie Redmayne was a pleasant surprise, with his rendition of 'Empty Chairs and Empty Tables', demonstrating exceptional vocal control, and leaving me tearful (again). Samantha Bark was excellent as Eponine, and I couldn't stop myself crying through 'On My Own' and 'A Little Fall of Rain'.